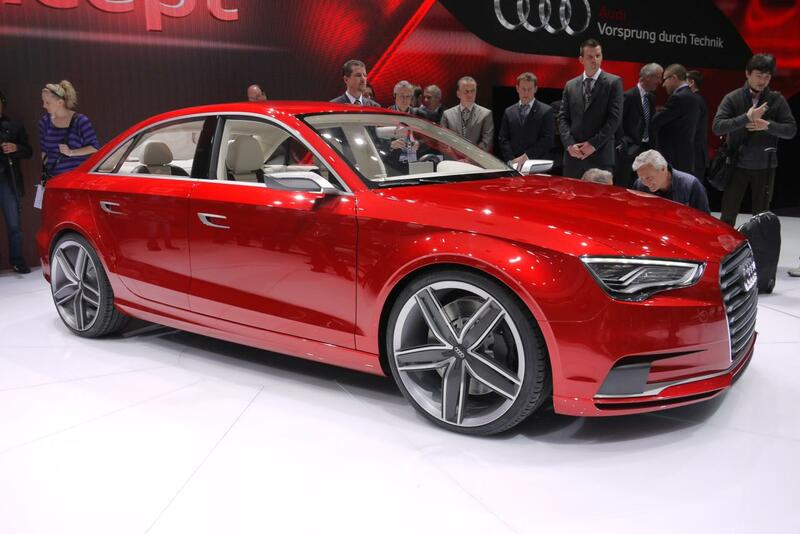 The Audi A3 sedan concept debuted at the 81st Geneva International Auto Show earlier this morning. The A3 sedan concept takes many of its characteristics from the European-only Audi RS3 Sportback. The chassis of the A3 concept was designed and engineered to the same specifications of the RS3. The result is a chassis featuring a McPherson front suspension with seperate axle support. Many of pieces that make up the A3 concept’s suspension are made of lighter aluminum instead of steel. The power plant under the hood of the A3 concept is a 2.5-liter, 5-cylinder engine, capable of producing 408 horsepower and 368 lb-ft of torque between 1,600-5,300 rpm. All of this horsepower and torque enables the A3 concept to accelerate from 0-60 mph in 4.1 seconds and is able to reach a top speed of 155 mph (electronically limited). Accompanying the performance figures, the fuel economy of the A3 sedan concept is equally acceptable. The A3 concept is estimated to get 25 mpg. The A3 sedan concept will be mated with the 7-speed S tronic transmission which allows the driver to choose between automatic and manual modes, depending on the manner in which they wish to drive. The transmission also features a launch control system, allowing the driver to accelerate from a dead stop with minimal tire slip. Of course this limited tire slip can also be attributed to Audi’s Quattro all-wheel drive system. The A3 sedan concept, as well as a wagon version will be focused to the U.S. market and could appear in dealer showrooms sometime next year.